Dallas Cowboys Owner Jerry Jones was the latest to be deposed in national anthem protester Colin Kaepernick’s grievance case filed against the NFL, sources say. On Thursday, Jones became the fourth NFL official questioned by Kaepernick’s lawyers, according to Pro Football Talk. Others deposed include Houston Texans owner Bob McNair, Baltimore Ravens General Manager Ozzie Newsome, and Ravens head coach John Harbaugh. Kaepernick filed his case against the NFL claiming that league owners “colluded” to keep him on the sidelines once he became a free agent at the end of the 2016 season because he invented the anti-American protests mounted during the playing of the national anthem. 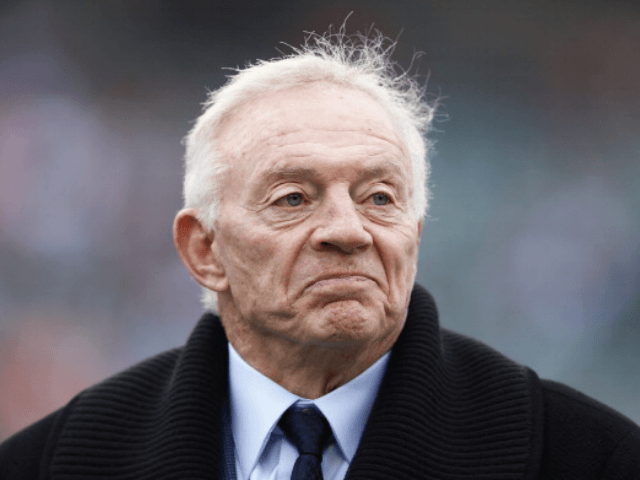 Jones was particularly targeted by Kaepernick’s lawyers because the Cowboys owner is well known for opposing the constant player protests against the United States, an act Kaepernick invented when he was a second-string quarterback for the San Francisco 49ers during the 2016 season. The Cowboys boss was one of the first NFL owners to criticize the protests, especially after the 2017 season began and saw the protests spread from a few players to dozens of players across the league. Indeed, in October of 2017, Jones insisted that he would not allow his team to participate in the protests. “If there’s anything that is disrespectful to the flag, then we will not play. OK? Understand? If we are disrespecting the flag, then we won’t play. Period. Period,” Jones said at the time. Jones also noted that the league was “suffering” from the protests that plagued games throughout the season. “There is no question the league is suffering negative effects from these protests,” Jones told The Dallas Morning News on October 22. It was also reported that Jones argued that the league should condemn the protests and put a stop to them in meetings with other owners. He was said to have relished being “the bad guy” on the topic. By November, Jones was saying that he “appreciated” comments made by President Donald Trump who criticized the anthem protests in no uncertain terms.